If the kindergartners from Kirchberg are traveling together now, you will see them from afar. 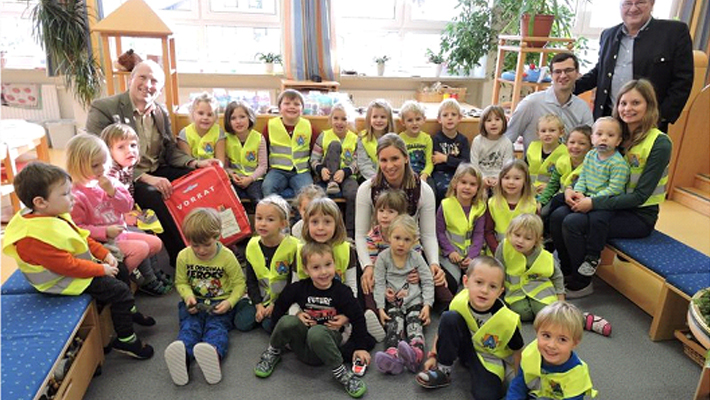 An important contribution to the safety of the youngest traffic subscribers is provided by the Upper Austrian Civil Defense with the promotional campaign for safety vests for kindergarten groups. The little Kirchbergers are already more visible and therefore safer on the way. Pedestrians are often dressed darkly and are perceived by the driver in poor visibility or darkness until very late. Safety vests with reflective fabrics provide a simple remedy, the visibility increases from 30 to 150 meters. It is recommended to wear light colored clothing with reflective tapes and reflect parts on clothing, shoes and school bags for the children. “Safety first,” emphasizes civil protection district manager Valentin Porringer, who, together with Mayor Franz Hofer and civil protection commissioner Klaus Fullerene, has handed over the safety vests to Kindergarten Kirchberg. “It’s not just about reducing the risk of accidents, but also raising children’s awareness of the dangers of poor visibility.” That’s why every kindergarten group also receives a safety memo developed by the O Schultz – a safety game that illustrates children’s everyday risks and avoidance of danger. By wearing the safety vest, by the way, children also become role models for their parents. The safety vests remain in the possession of the kindergarten and are therefore usable for years. Kindergartens or communities can order the warning vests at the Upper Austrian Civil Defense at a promotional price.